The Razor was designed with total economy in mind. To keep everything as simple as possible, with no extraneous extras…to be a simple magnet on wheels. 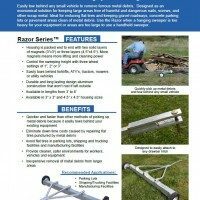 Easily attach this towable parking lot sweeper to any small vehicle to remove ferrous metal debris quickly and easily. This is an economical parking lot sweeper for keeping large areas free of dangerous metal debris. The magnet provides a quick and easy method for reducing flat tires and accidents. Use the Razor tow behind magnetic sweeper when a hanging sweeper would interfere with normal operation of the vehicle or when areas are too large to use a handheld sweeper. Inexpensive removal of metal debris from larger areas. "This has been a happy purchase for us. Wish we had done this long ago." Eliminate down time costs caused by repairing flat tires punctured by metal debris. Pickup metal debris quickly and easily without a large investment. Quicker and faster than other methods of picking up metal debris because it tows behind your existing equipment. Easily tows behind forklifts, ATVs, tractors, mowers or utility vehicles. And there are lots of options in sweeper width and housing size to fit your requirements. Width range from 2 to 8 feet and magnetic housing sizes of 3″x3″ and 4.5″x4.5″. Welded aluminum 1/8″ walls with steel 8″ ball bearing wheels makes this magnetic sweeper durable and ready for all weather conditions and durable. Control the sweeping height from 1″, 2″ and 3″ to accommodate any situation. Change height by moving axle hole position. Height adjustment allows fine tuning of performance on a variety of terrains and conditions for optimum performance. Super Agile… Sharp Turning… No Problem. Easily manoeuver the Razor behind your equipment. 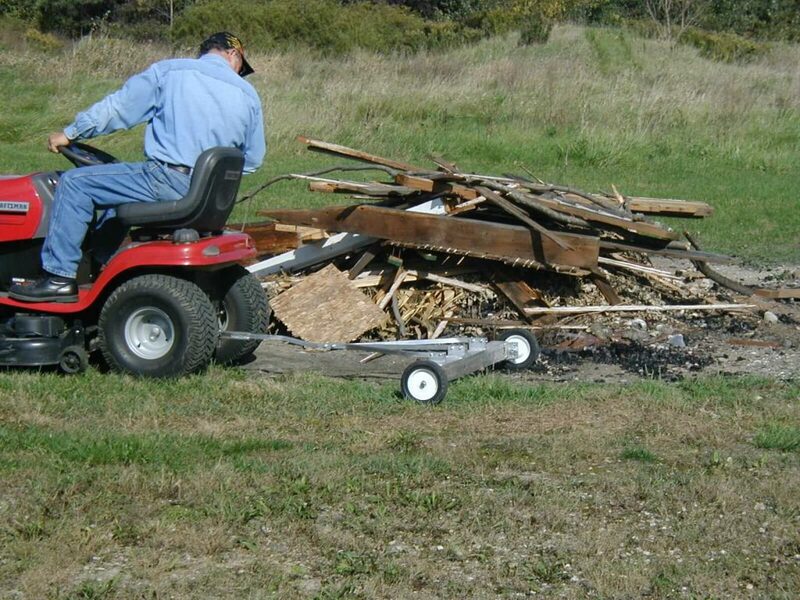 Move quickly and easily over your area to remove metal debris. Wagon style hitch can be attached to forklifts, ATVs, tractors, mowers or utility vehicles. Available in lengths from 2 to 8 feet. Rugged durability aluminum welded construction. Three sweeping height settings of 1”, 2” or 3”. 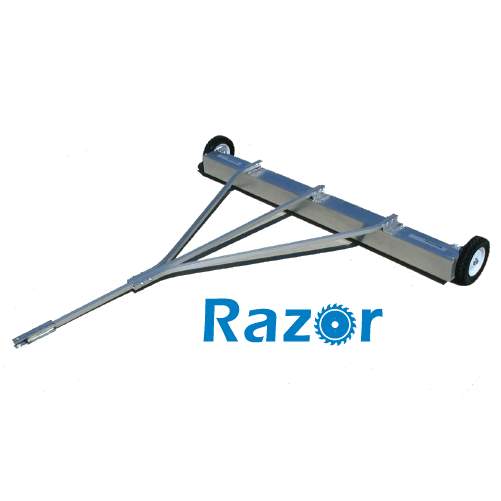 Click Here to View Specs for the Razor 3"x 3"
Click Here to View Specs for the Razor 4.5"x 4.5"
Razor 38 3 "x 3"
Razor 50 3 "x 3"
Razor 62 3 "x 3"
Razor 74 3 "x 3"
Razor 86 3 "x 3"
Razor 98 3 "x 3"
Razor 38 4.5 "x 4.5"
Razor 50 4.5 "x 4.5"
Razor 62 4.5 "x 4.5"
Here at Preston Cycle, we have been looking for the answer to nails and metal debris on our six acre lot. We recently purchased on of Blustreak’s Razor Series of Magnetic Sweepers that we tow with our garden tractor. We have a paved front lot and a gravel rear lot. The Magnetic Sweeper worked equally well in both areas, picking up nails, bottle caps, wire and pieces of steel. We even use it behind our mower when we are cutting our grass. It is surprising what it picks up. This has been a happy purchase for us. Wish we had done this long ago.